If you’d like to have a patio room installed at your home in Savannah, Georgia, your first step will be to find a company you can trust to handle the project. At Porch Outfitters, we are outdoor living specialists who have served countless satisfied customers since 1987. 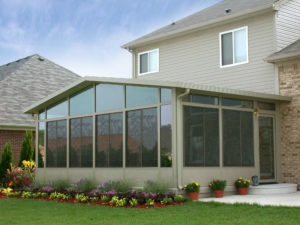 We offer a variety of patio enclosures and have a proven commitment to quality. For example, not only are we A+ rated with the Better Business Bureau, we have received a Best of Ridgeland Award from the U.S. Commerce Association for Best Sunroom Contractor. Whether you’d like a fully enclosed patio room or a screened enclosure, we have the ideal solution. Our sunrooms, which are from the celebrated manufacturer TEMO, bring the outdoors in, allowing you to enjoy a naturally lit space with beautiful panoramic views within the climate-controlled comfort of your home. TEMO sunrooms are built from only the finest materials to ensure they last long into the future with minimal maintenance required. And, they are available in a variety of styles to suit your unique needs. When it comes to our screen enclosures, we provide completely custom builds. These patio rooms are perfect for keeping debris out of your pool, protecting you from pesky insects, and providing some shade while still allowing you to enjoy the beautiful weather and fresh air. When you trust Porch Outfitters to build a patio room at your home in Savannah, GA, you can be sure your investment will be well protected, as we’ll provide an incredible lifetime workmanship warranty. Contact us today to get started on your outdoor living project.